Imagine human-like robots that collect information through their skin and clothes to better assist their human owners. Sound too futuristic? Dan Popa and his collaborators don’t think so. 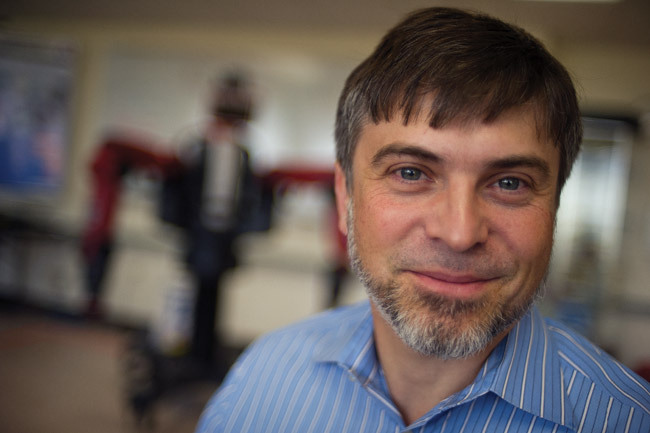 The electrical engineer received a $1.35 million National Science Foundation (NSF) grant to make better robots and robotic devices, improve prosthetics, and enable those devices to perform tasks that people can no longer do themselves. The four-year project is part of the NSF’s National Robotics Initiative, which is aimed at accelerating the development and use of robots that work beside or cooperatively with people. The UT Arlington grant was the largest among the initiative’s 37 awards last fall. The NSF says its robotics initiative can address a broad range of national needs such as advanced manufacturing, logistics, transportation, homeland security, defense, medicine, health care, space exploration, and agriculture. NASA, the National Institutes of Health, and the U.S. Department of Agriculture also are participating in the initiative.